Penhallow is a stone gargoyle (though the proper term, he says, is a “Grotesque”). He protects his building and its residents from the evil, undead Netherkin, who attack the living from the shadows. One night, his only friends are killed, leaving him as the last Grotesque in the city of Boston. That’s not the only worrisome thing that’s happened, though. His new wards are being attacked by Netherkin much more than usual, a mysterious October snowstorm is coming, and strange figures are prowling the city. He meets a human named Viola, who can converse with Grotesques. Penhallow doesn’t know whether to trust her and accept her help in tracking down who (or what) is behind the strange happenings. An ancient plot is resurfacing, and Penhallow may be the only one who can save his wards and the entire city. The Last Gargoyle is a perfect blend of action and humor. Along with chilling intensity and sinister plots, there is also the kind of sarcastic jokes I love to see in the books that I read. The dry humor also helps define Penhallow as a character. At first, Penhallow may not seem like a very flawed character because he’s brave, vigilant, and focused on the task at hand. But with his friendship with Viola and the unfogging of his own past, he faces many emotional struggles just as difficult as his fights with the Netherkin.The book’s first-person point-of-view from the perspective of Penhallow helps keep the other characters’ secrets in shadow, making their reveal a lot more climactic. This book originally caught my eye because it was set in Boston (since I live near the city and visit it often). I highly recommend this book to anyone who has ever been to Boston, as many events in the story take place at or near famous places such as the Prudential Center, the Theater District, and Boston Common. 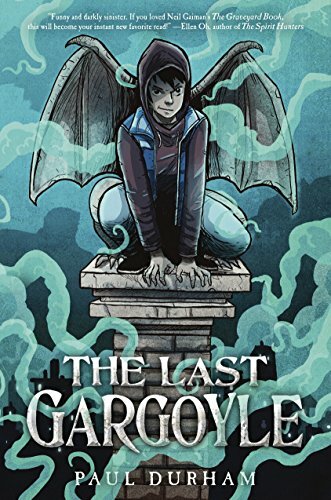 With a gripping plot, dark twists, and a real-life setting, The Last Gargoyle will appeal to fantasy-lovers everywhere. There is some intense peril and mild violence.